Switching to energy-saving appliances? You’re in luck. The government is doling out $300 million for clunker appliances. Cash for appliances aims to spur economic growth and encourage the use of energy-efficient refrigerators, washers and dryers and heating and cooling systems. “It’s meant to encourage the replacement and proper recycling of units of high inefficiency,” said Bobbi Fey, assistant director of residential programs with Wisconsin’s Focus on Energy. Each state receives funds proportionate to its population and manages its own program. 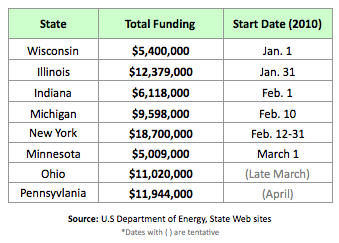 Great Lakes states have $80 million to hand out. Most states offer the same deal – anywhere from $50 to more than $2,000 in rebates for kitchen appliances, clothes washers and furnaces. The Pennsylvania and Indiana programs only offer rebates on heating, ventilating and air conditioning or HVAC systems. “The whole point is to increase energy efficiency in Hoosier homes. If you want to take one appliance in your home that would have the biggest increase in efficiency, it would be the HVAC system,” said Eric Burch, director of policy and outreach for the Indiana Department of Energy Development. Wisconsin was the first Great Lakes state to offer appliance rebates at the start of the year. Indiana, Michigan, New York and Illinois now issue incentives. Ohio, Pennsylvania and Minnesota programs start in the next two months. Wisconsin received 7,000 rebate applications in the first month, Fey said. The state has about $5 million to spend and has processed $450,000 in residential rebates. Residents can receive $100 when they purchase energy efficient clothes washers and $200 for oil and gas furnaces, according to the Focus on Energy Web site. Both are popular, Fey said. Furnaces also qualify for Wisconsin rebates. “It’s double or even more on some of the savings,” she said. To qualify in all states, appliances must be certified as Energy Star, a standard for consumer products established by U.S. environmental and energy agencies. Certified refrigerators use 20 percent less energy than non-qualified models and can cut energy bills by $165 over their lifetime , according to the Energy Star Web site and savings calculator. In Wisconsin, residents must prove that they are going to properly recycle old appliances. But that’s not the case in all states. And some policy makers worry that people will keep the old appliances, doubling their energy use. That’s why the Indiana program only offers rebates on heating and cooling systems, Burch said. 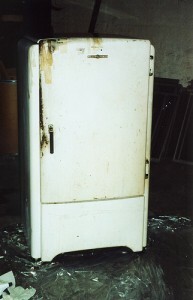 Wisconsin doubles the rebates for residents who prove they recycled their old refrigerators and freezers. State incentives stop when the money runs out. Fey expects Wisconsin’s funds to last less than a year.